With the NFL season starting this week, a word easily associated with the sport is “concussions”. With over 270 cases occurring in the 2015 season, it is a great concern with many players over the course of their career. While 90% of concussions are sporting related, they are also common in car accidents and slip and falls. What are concussions? A concussion is defined as a complex pathophysiological process that affects the brain, typically induced by trauma to the brain. It can be caused either by a direct blow to the head, or an indirect blow to the body, causing neurological impairments that may resolve spontaneously. The adult brain is a three pound organ that basically floats inside the skull. It is surrounded by cerebral spinal fluid, which acts as a shock absorber for minor impacts. 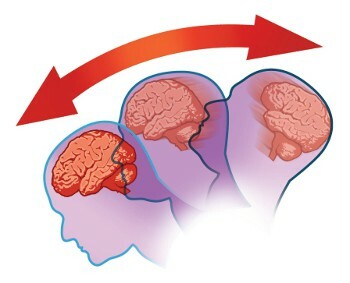 When the brain moves rapidly inside the skull, a concussion has technically occurred. * Neurological Test: a basic neurological exam in the ER assesses motor and sensory skills, the functioning of one or more cranial nerves, hearing and speech, vision, coordination, balance, mental status and changes in mood and behavior. * CT Scan: a CT scan is a specialized computerized X-ray that provides images of the brain and is sometimes used to look for suspected bleeding or swelling. * MRI Scan: a Magnetic Resonance Imaging test provides detailed photos of the brain using magnetic energy instead of radiation. * Get plenty of sleep at night, and take it easy during the day. * Avoid alcohol and illegal drugs. * Do not take any other medicines unless your doctor says it is okay. * Avoid activities that are physically or mentally demanding (including housework, exercise, schoolwork, video games, text messaging, or using the computer). You may need to change your school or work schedule while you recover. * Ask your doctor when it’s okay for you to drive a car, ride a bike, or operate machinery. * Use ice or a cold pack on any swelling for 10 to 20 minutes at a time. Put a thin cloth between the ice and your skin. * Use pain medicine as directed. Your doctor may give you a prescription for pain medicine or recommend you use a pain medicine that you can buy without a prescription, such as acetaminophen (for example, Tylenol). Or visit our website at www.corerehab.info.